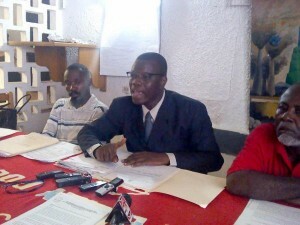 Attorney Patrice Florvilus speaks at a press conference denouncing threats made against him and other Haitian human rights defenders. Those were the words delivered to Frena Florvilus, Director of Education and Advocacy of the Haitian human rights organization Defenders of the Oppressed (DOP), early on the morning of August 11 by one of four unidentified men who attempted to enter DOP’s office. The threat echoed numerous others that have been leveled against the DOP office and its staff since they took on the case of a young man who died in police custody within hours of his April 15 arrest, his body left covered with bruises and wounds inflicted by a severe beating. DOP has also been targeted for its work to support displaced peoples who face violent eviction from their camps, by the government and private landowners who are determined to rid the country of camps. Never mind that the people, homeless since the January 2010 earthquake, have nowhere else to go. Reynald Georges, a lawyer representing Haiti’s ex-dictator, Jean-Claude Duvalier, has brought formal accusations of arson and “association with wrongdoers” (conspiracy) against DOP’s founder and director, Patrice Florvilus, and five others. The accused received criminal court summons for Monday, August 19th. Their lawyers filed an objection and request that the charges be dropped, but the prosecutor’s office has reissued the summons for Thursday, August 22nd. Florvilus is one of several Haitian human rights defenders being accused of committing the very crimes they are investigating. In the past year, other lawyers have received threats of arrest or death to silence their probing into corruption and human rights violations taking place under Haiti’s current administration. The latest wave of threats relate to a chain of events that started on April 13th, when some 1,500 families living in a camp known as Camp Acra, came under threat of eviction from lawyer Reynald Georges. Georges is best known for representing the recently returned ex-dictator, Jean-Claude Duvalier, who faces charges of crimes against humanity. Witnesses have stated that Georges entered Camp Acra brandishing a firearm, guarded by five Haitian officers and accompanied by a justice of the peace. He threatened to remove people from the land by “any means necessary.” Claiming at the time that the land belonged to his client, Duvalier, Georges is reported to have told the crowd that heavy equipment was on its way to raze the camp. At 2:00 a.m. that morning, unknown assailants attempted to burn down the camp.Arson attacks have been used repeatedly to illegally evict displaced earthquake survivors still stuck in the camps. Families in Camp Acra activated to contain the fire to the several tarp shelters upon which ignited gasoline-soaked rags had been thrown. No physical injuries were reported. When camp leaders traveled across the street to the police station to report the attack, officers told them that they “did not have the resources to respond.” As with every other IDP camp that had been set on fire, authorities never investigated this attack and no arrests were made. In an attempt to draw attention to the situation, at 5:00 a.m. that morning camp residents staged a protest on the main street just outside their camp, blocking a main thoroughfare, Delmas 33. The police, now finding the “resources to respond,” came in to break up the protest and randomly took two men into custody. One of the two, the young Méris Civil, died within hours of being taken into police custody. His body was left covered with bruises and wounds. His corpse was wrapped in a sheet and taken to the General Hospital’s morgue by the police. After DOP agreed to represent Lexima and the family of Civil, Florvilus observed on three separate days in April that he was being followed by a police vehicle. In May, after DOP held a press conference to denounce Civil’s killing, a police source gave Florvilus the names of seven officers he alleged had developed an intricate plan to assassinate him before any case could be brought forward. Later in May, two men claiming to be police threatened Lexima to “not speak publicly about [his] time in [their] custody” or to say that he or Civil had been beaten. Knowing that their lives—and that of their families and colleagues—are in danger, Florvilus and the staff of DOP now live under a state of siege. They take different routes to and from work every day. Florvilus and his family have moved to a more secure location, and he is accompanied by a white, American man during his work days for added protection. Pending the availability of further funding, DOP is now considering hiring armed guards at its offices. Florvilus has filed a request for an investigation of the threats leveled against him with the public prosecutor’s office. Despite the intimidation and threats, DOP—whose focus is on accompanying Haiti’s civil society groups and neglected population—continue their work, but not without a price. Those being targeted live under the constant stress of wondering if an assassin’s bullet awaits them each time there is a knock at the door or as they dart outside the office into their awaiting transportation. In transit, a silence falls over their vehicles each time they pass a police patrol or check point. When faced with the threats on their lives and the real possibility of time spent in an overcrowded prison cell, reality may seem grim. Rather than retreating and abandoning the fight, DOP and its partners are facing those responsible head-on, embracing Haiti’s long tradition of rebellion against injustice. Please respond to this action alert from Frontline Defenders. Make a donation to help the financially struggling DOP to help with security costs. Other Worlds will gladly channel your funds directly to DOP. Instructions are here. Mark Snyder is an independent human rights activist who has been living in Haiti, coordinating with Haitian civil society movements since 2008. After the January 2010 earthquake, his main focus has been on supporting housing rights and anti-eviction efforts. After the assassination plot against Patrice Florvilus was exposed, Mark has accompanied him during the day in hopes of deterring an attack. Mark has written numerous articles and public reports from the ground in an effort to translate and amplify the messages from Haitian social movements, and was a contributing author of Tectonic Shifts: Haiti After The Earthquake.